Two years ago, comparing Steph Curry and Russell Westbrook would have been laughable. But when a friend of mine suggested a few weeks ago to analyze the differences between two of the NBA's elite point guards, I paused. Curry's rapid ascension to superstardom hit national airwaves a year and a half ago, when he went off for 54 points in Madison Square Garden on ESPN. He hit an unconscious 11 of 13 from beyond the arc...something even the best NBA 2K players probably couldn't do in the video game. He's one of three players in NBA history to hit 10+ threes on 80%+ from the field, and the only one to hit 11 threes. At that point, Russell Westbrook had already seen time in the NBA Finals alongside the now-2014 MVP, Kevin Durant. 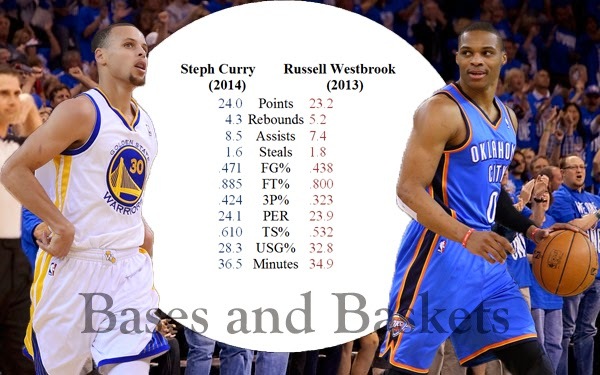 A comparison of Steph Curry vs. Russell Westbrook is an appropriate one to have. Despite playing the same position, the difference in how Curry and Westbrook play is striking. Both qualify as "scoring point guards" under a metric, traditional-to-scorer rating (TSR), that I developed in December 2012. The keys to Westbrook's success in scoring rely on his umatched athleticism, both in speed and in strength. His signature pull-up jumper at the free-throw line is a deadly counter to his vicious drives to the rim. Something that I've always been baffled by, though, is Westbrook's ability and desire to consistently shoot more than Kevin Durant, now a three-time scoring champion. Westbrook's and Durant's relationship parallels the early 00s version of Kobe and Shaq. Both are top players in the game, but one in their established prime/peak while the younger one vies for often less efficient shots. Westbrook has a career 43 percent FG pecentage. Kobe is at 45 percent for his career. The salient point of Curry's and Westbrook's career numbers are that they are incredibly similar. The only noticeable differences are in rebounds, field goal percentage, free throw percentage, three-point percentage, true shooting percentage, and usage rate. The main surprise worth noting that favors Curry is the difference in usage rates. Westbrook has a 20% higher usage rate than Curry which means even though Curry is the clear number one option on his team, Westbrook still uses more of his teams' possessions. It might be attractive to point out that the numbers don't show that Westbrook has a superstar on his team while Curry does not. But that point is mitigated when considering this discrepancy in usage rate that shows Westbrook still manages to use more of his team's possessions. The corollary to this is that as defenses can hone in on one player, that players efficiency should suffer. This was true for Curry, who has taken on a greater percentage of the scoring load and seen marginal decreases in efficiency over the past few years. It's clear who has the statistical edge here. It's also a very short list of seasons in NBA history where a player has hit 200+ threes and had a true shooting percentage above 60. Curry is on there with a performance considered mildly "inefficient" for him. Where stats often fail to grasp a player's value is on defense. Defensive win shares and defensive rating both suggest that Curry is on par with Westbrook, but it's clear that this would be a misguided conclusion. Westbrook's athleticism and tenacity on offense don't disappear on defense. Curry's mediocre defense is not for a lack of effort so much as it is simply just a lack of size and raw athleticism. The Warriors strive to cover up Curry as their primary weakness on defense whereas the Thunder can count on Westbrook to contribute on both ends of the floor. Belittling a player's defensive value would be a mistake, but the NBA is a scoring league first and foremost. The Chicago Bulls and Indiana Pacers, both known as defensive juggernauts, ultimately met their demise in the 2014 NBA playoffs. As Magic Johnson would say, to win you need to score more points than the other team. Anyone who regularly reads my writing knows how much I love the hypothetical switches when comparing players. We already went through one on this Curry vs. Westbrook comparison (how would Westbrook fair as a primary scoring option a la on the Warriors?). 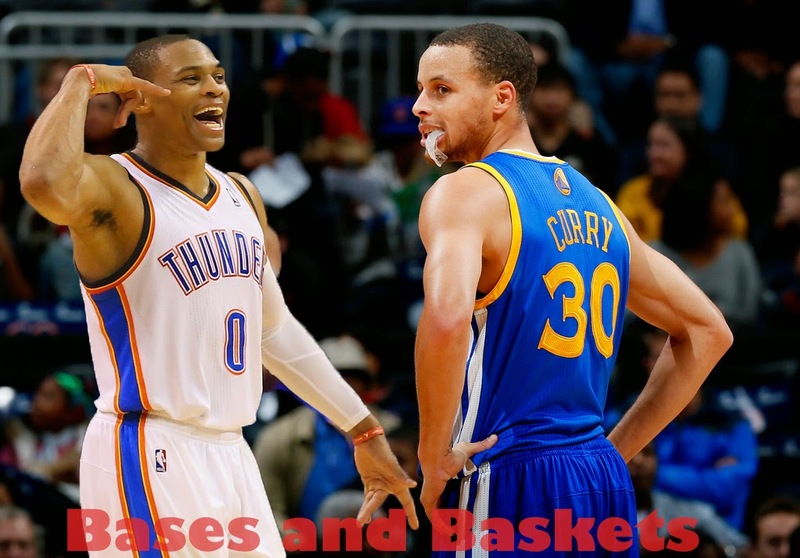 Now for the other side of the coin: what if Curry were to be on the OKC Thunder? Curry, Durant, and Ibaka as a Big 3 would be one of the best Big 3 in recent memory. I would take those guys over LeBron, Wade, and Bosh. Over Pierce, KG, and Allen. On par with LeBron, Love, and Kyrie. Imagine an unselfish point guard - who can score in any variety of ways - paired up with the league's most prolific scorer and a defensive stalwart who can also hit midrange jumpers and run the P&R as necessary. A trio of Curry, Durant, and Ibaka would win bigger than Westbrook, Durant, and Ibaka has or will. Can I prove that? No. But chemistry is a big key and while Durant likes to play up the brotherly love that he has with Westbrook, does he really have a choice? KD realizes that he's not getting a better sidekick, so might as well butter him up and feed him what he wants to hear. Curry's style would mesh better with Durant and OKC could cover up Curry's weaknesses on defense without a problem. And they seem like they get along fine off the court. Curry's finesse game relies on the game's best jump-shot and handles that can break down anybody. We are trained, as NBA fans, to have less respect for that. The best player in the game, LeBron James, has made NBA fans appreciate the dominance that can be enforced by strength, skill, and speed. The greats before him did, too. Curry doesn't have the same strength and perceived toughness as the Melos, LeBrons, Kobes, and Westbrooks of the NBA. He takes a hit in the eyes of NBA fans as a result. Westbrook is an All Star. He's a superstar. I must say I surprised myself with the conclusion of this column because I had just sketched a rough draft for my top 30 NBA players for the 2014-15 season and I had Westbrook ahead of Curry. The numbers say otherwise. The hypotheticals do, too. OKC's success has a lot to do with Westbrook, but he's playing with the NBA MVP as well as another borderline All Star. So Curry or Westbrook? Let's boil it down to three questions: who would prefer to build a franchise around, who would win you more games as the point guard for the 2015 Warriors, and who would win you more games as the point guard for the 2015 Thunder? The Akron native, Wardell Stephen Curry, is my pick. The column lead photo and statistical comparison photos are my original designs. I spent way too much time doing them. But they were fun to do. No more boring Excel tables for comparisons! Excellent breakdown. I'm glad you decided to this I agree that if Stephen Curry and KD were on the same team we would have to shut down the league. Some may say that WB compliments KD's play better because of KD's shooting ability. But I look at the 2 best shooters in the league and say the floor spacing would be much easier for KD and Curry to drive and same with the other players. Curry's overall playmaking ability > Westbrooks Driving advantage and defense. Appreciate that! Glad you liked it and thanks for the suggestion, I enjoyed writing this piece a lot. And truly...a KD-Steph combo would shut down the league. I hear you on that complement point. I would add that Curry also provides that ability to drive that Westbrook does. Westbrook does it with pure athleticism but Curry's finesse game can/has get him to the rim, to. Pleasantly surprised that you agreed, too. 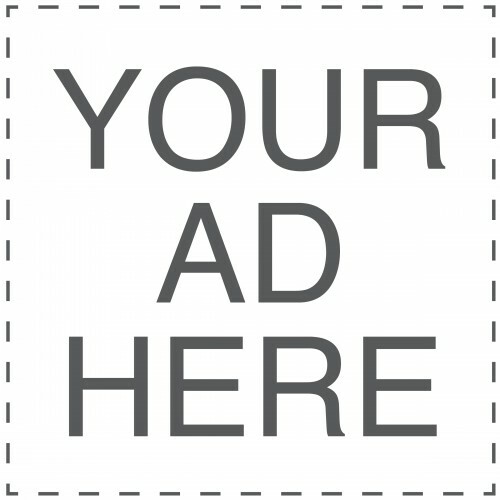 I was shocked myself, as I wrote in the column, that I came to the conclusion that I did. The thing is even though many consider RW a 2 guard in reality he's not. He's a PG. And IMO Curry would be playing the 2 IMO because he can spot up and his shot is excellent. You mentioned Curry can drive and I def agree if there was one part of his game outside of defense that I believe can get better it's his ability to finish around the rim. If he can do that it would make his game that much more polished. But RW's jump shot seems like it has improved anyways but it's hard to say for sure because his FG% was at it's peak 2 seasons ago. Anyways the most important thing I like in my PG is the ability to run an efficient offense and although RW has improved there Curry on the next level in terms of running the Warriors offense. Yea it is kind of interesting how WB hit his peak from 16-24 FT 2 years ago. You'd normally expect a player to incline during their peak/prime years and then start to decline towards the end of their prime. It's also say maybe that it's a bit subjective that RW runs the Thunder offense better than he ever has. I'd say the biggest thing about WB's game that has improved and why I think he's at his best ever is #1. He's under more control than ever #2 He played at his all time highest level in the playoffs last season like > 2011 Derrick Rose level. As for Curry I seriously wonder if he could get any better. I mean don't get me wrong his peak right now is excellent but I just hope that he's able to take it to the next level. If he can he would be in the CP3 argument for best PG in the league.